The 1940s witnessed the release of many gaslight melodramas, including The Lodger, The Body Snatcher, Hangover Square, and, of course, Gaslight. 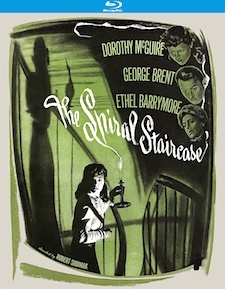 The Spiral Staircase fits into that category, though it is also a thriller and film noir with touches of horror. Mostly set in a large New England mansion, the film centers on servant Helen (Dorothy McGuire), traumatized as a child and mute ever since. The woman who owns the house is elderly, bedridden Mrs. Warren (Ethel Barrymore). Other characters are new physician in town Dr. Parry (Kent Smith), stepbrothers Prof. Warren (George Brent) and Steve Warren (Gordon Oliver), attractive secretary Blanche (Rhonda Fleming), Nurse Barker (Sara Allgood), and frequently inebriated cook Mrs. Oates (Elsa Lanchester). The film opens with the murder of a young crippled woman by an unseen assailant hiding in a closet. All we see is a close-up of the person’s eye, staring, just the way Norman Bates would stare at Marion Crane 14 years later in Psycho. The murderer’s identity is not revealed. As in traditional murder mysteries, the killer is among the various characters introduced along the way. Director Robert Siodmak throws suspicion on several of them, maintaining suspense throughout. Because the murderer targets women with physical imperfections, Helen is in danger. Only a few scenes take place outside the house and one is especially atmosphere-rich. Helen is walking alone through a wooded area when the wind kicks up in advance of a storm. As she approaches the house, the sky darkens, thunder crashes, rain starts falling, and a shadowy figure is seen lurking behind some trees. Helen’s key falls into a puddle, and as she tries to retrieve it, the figure moves closer. Roy Webb’s music, the thunderstorm, and Helen’s helplessness create an excellent moment, establishing the moody tone of the film. Ms. McGuire’s role is almost entirely silent, so she must rely heavily on expression and reaction to convey what she’s thinking and feeling. Sometimes she does this subtly, other times her reactions are more extreme, resulting in a nicely nuanced performance. The screenplay is talky but focus always remains on the silent Helen, who exhibits both vulnerability and strength. Ms. Barrymore is similarly restricted in her acting choices because her character is immobile. Her eyes are quite expressive and her thoughts are never in doubt. Mrs. Warren may not be able to get around, but her mind is sharp and she doesn’t miss a trick. George Brent, a generally bland actor, was usually cast in movies opposite strong leading ladies. He made 11 movies with Bette Davis alone. It was important for his Prof. Warren not to overshadow Helen, and indeed he does not. Kent Smith, too, generally was cast not to dominate the lead actress. His most famous role was as Oliver Reed in Cat People opposite Simone Simon. Both actors are serviceable and hardly scene stealers. The Spiral Staircase explores the lasting effects of psychological trauma in a simplistic way but its explanations feel authentic. Stylistically, the film has much to offer from Siodmak’s direction, the excellent cast, Nicholas Muscuraca’s shadowy photography, and a gradual build-up of suspense. The Blu-ray release is newly restored in HD from a 4K scan of a restored fine-grain master. Video resolution/Codec. is 1080p/AVC MPEG-4. Aspect ratio is 1.33:1. The picture is sharp, with deep blacks and nice gradations of light and shadow. Details in the indoor sets (flower arrangements, wallpaper, carpeting) are quite distinct, and the outdoor night scene delineates among raindrops, leaves, blowing branches, and a shadowy figure. Particularly notable are the shots in which Siodmak zooms into the killer’s eye, revealing what he is seeing and how he imagines his victims. The DTS-HD Master Audio 1.0 track is crisp. Dialogue is distinct and sound effects of the thunderstorm vary appropriately between interior and exterior scenes. The sound effects never obscure dialogue. The musical score adds mood without overpowering the action. Optional English subtitles are available. Bonus features include audio commentary by film historian Sara Smith, a 1945 Screen Director’s Playhouse radio broadcast of The Spiral Staircase starring Dorothy McGuire and Robert Siodmak, and a series of theatrical trailers. Audio Commentary – Sara Smith is the author of In Lonely Places: Film Noir Beyond the City. She provides background on gaslight melodramas of the 1940s, a brief overview of Robert Siodmak’s directing career, and profiles of the actors as they are introduced. She explains Hollywood’s fascination with Freudian psychology after World War II as a result of soldiers returning from the war with post-traumatic stress disorder. Comparing the style of the movie to those of Val Lewton, known for conveying moods of dread, she describes the expressionistic photography and the elements of horror. Smith is extremely knowledgeable, informative, and engaging – a model of what Blu-ray commentary should be. Radio Broadcast – The 30-minute NBC radio broadcast had its challenges. Because the central character is mute, the script was adapted to have Dorothy McGuire both verbalize the mute character’s thoughts and narrate the action. With the constant talk necessary in radio, the element of suspense is seriously compromised. The radio program is an interesting companion piece to the movie, but not nearly as effective. McGuire is the only actor from the film to reprise her role. Trailers – Five trailers are included: The Spiral Staircase, Cry of the City, I Wake Up Screaming, Deadline U.S.A., and Daisy Kenyon.